Cable Panel Pullover Sweater for SIL finished! 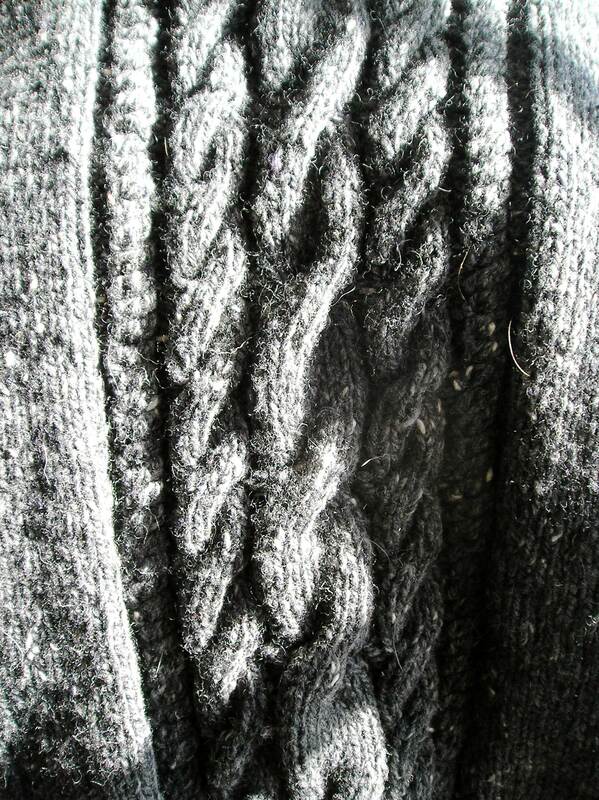 It’s hard for me to believe, but I’ve finally finished the Cable Sweater for my SIL, Karen. This sweater started as a Christmas present for 2006, so you can get an idea of what a saga it’s been. Obviously, I didn’t get it finished for Christmas 2006, or her birthday in February 2007 (that was plan B), or Christmas 2007, or her recent February 2008 birthday (Plan Z?). 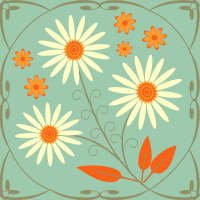 Fortunately, although she’s notoriously difficult to shop for, she’s a very understanding and patient gal who doesn’t hold it against you if you’re late–very late–with gifts. And, with this sweater, I think I’ve found the perfect present. She almost always wears dark grays and blacks, so I chose this great Rowan Yorkshire Tweed DK (color #354, “Gust”), a dark speckled, tweedy charcoal gray. When I began this sweater, they had just discontinued Yorkshire Tweed so I almost felt like I was racing the clock trying to get this sweater done before it became completely impossible to obtain any more balls. 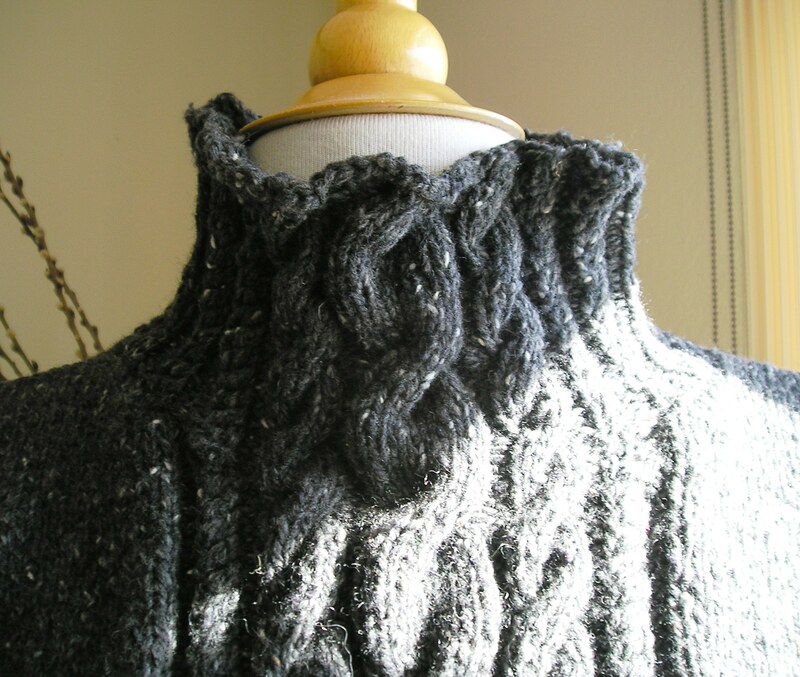 Of course, as time passed by, my calculations indicated that I was going to run out of yarn with about two inches left on the funnel neck collar. D’oh! Several searches on the internet came up with the friendly people at Hampton Knitting Yarn who were able to send me not only a ball of 354, but also a ball of 352 (“Goose”) to finish the Cardigan for Arwen. Thank you, Masked Knitters! To the right, you can see a picture of the results (pardon the shadows). The extra balls matched perfectly for both projects–talk about great dye lot karma! The pattern comes from Ann Budd’s extraordinarily useful book, The Knitter’s Handy Book of Sweater Patterns. I can’t say enough about this book! If you are interested in starting to design your own sweater patterns, or in gaining a better understanding of how sweaters work, this would be a great place to start. I consult this book all the time in my professional pattern-writing work since it provides instructions for the basic configuration of all kinds of sweater types (different sleeves, different collars, both adult and children’s sizes). 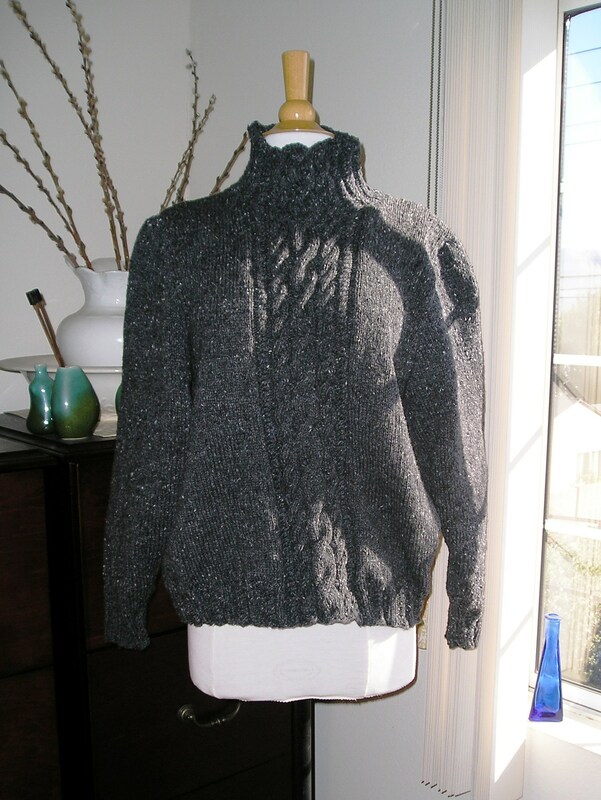 If all the patterns are as clearly written as this “Cable Panel Pullover,” you shouldn’t have any problems at all following them, even if you make modifications as I did. I decided to change the sleeves from modified drop shoulder sleeves to set-in sleeves and I had no problem recalculating the pattern since Budd walks you through every step for every gauge and size. The diagrams are also extensively annotated. As if all of that wasn’t enough, the book is designed like a spiral-bound notebook so it lies open flat while you’re working. Very convenient. Now keep your fingers crossed that it fits!